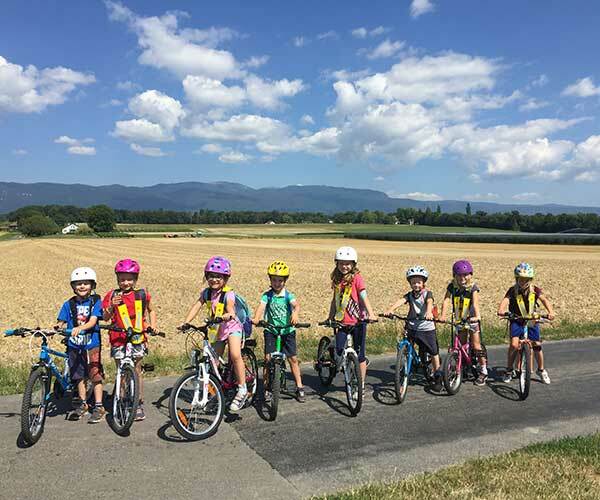 WITH THE JURA KIDS CAMP, YOUR CHILDREN WILL DISCOVER AND PLAY A WIDE RANGE OF SPORTS IN A FUN ATMOSPHERE: CYCLING, RUNNING, ATHLETICS AND BALL GAMES. We will also work on developing more creative and practical skills with other activities such as land art, drawing, treasure hunts and building treehouses. Our aim is to spend as much time as possible outdoors, but in the event of bad weather, the activities will be held indoors. The number of spaces is limited to 20 children in order to give your children the full attention they deserve and maximize their happiness. The camp is opened to all children, regardless of where they live. Children must be able to cycle without stabilizers. Supervision will be done by highly motivated staff with many years experience organizing kids camps in Switzerland. The staff is bilingual French-English. The child/adult ratio is 7:1, to ensure great care of your children.